The bright-red Glacier Express is a narrow-gauge line that offers direct service between the exclusive ski resort of Zermatt and chic St. Moritz. Its route through Switzerland’s spectacular mountain scenery passes across gorges, over glaciers, and above river valleys, making it one of the most breathtaking scenic train rides in Europe. The train makes five stops on its 180-mile run, passing over 291 bridges and viaducts and through 91 tunnels; the highest point along the route is the Oberalp Pass between Andermatt and Disentis, at over 6,600 feet. 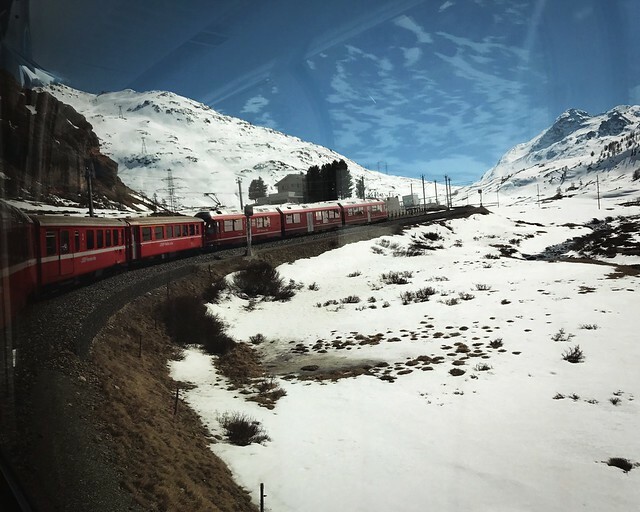 Passengers can board the Glacier Express at Zermatt or St. Moritz and take a one-way trip in a single day, or you can stop to explore the towns of Visp, Brig, Andermatt, Disentis or Chur along the route, stretching out the journey over a few days. 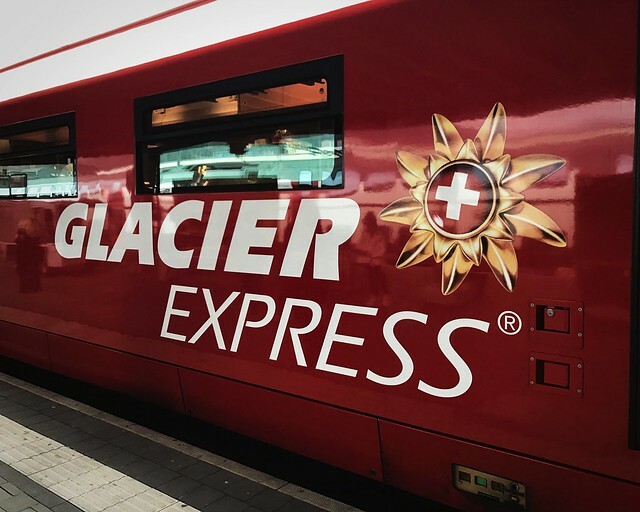 The Glacier Express runs daily all year long, with the exception of a few weeks each fall when service is suspended for maintenance. Three trains depart each morning in the summer, and offer views of lush Alpine scenery; from December to May there is one daily departure and dramatic vistas of snow-capped peaks if you get clear weather...when we took the trip, we got clouds and snow for most of the trip. There are 2- and 4-person compartments in 1st class and 4-person compartments in 2nd class; a full-service restaurant car serving gourmet traditional dishes, vegetarian and Indian options, and a children's menu; and a panoramic bar car. Waiters on the train pour liqueurs from an impossible height into a little glass while the train is moving without spilling a drop, which you can either find endearing or kitsch...we lean toward the former! The Glacier Express route links to another scenic Alpine train route in Chur: the UNESCO World Heritage–listed Bernina Express that runs over the Bernina Pass to Tirano just east of Lake Maggiore. Known as the Trenino Rosso (Little Red Train), this historic narrow-gauge line is the highest in the Alps and its “little engines that could” have been chugging across the Swiss-Italian border for over a century. One of the most photogenic trains in the world, the Bernina Express follows a route between the Italian town of Tirano and Swiss Chur, combining beautiful scenery with the allure of crossing from the palm trees of Lake Maggiore to the snowy peaks of Chur in just over four hours. 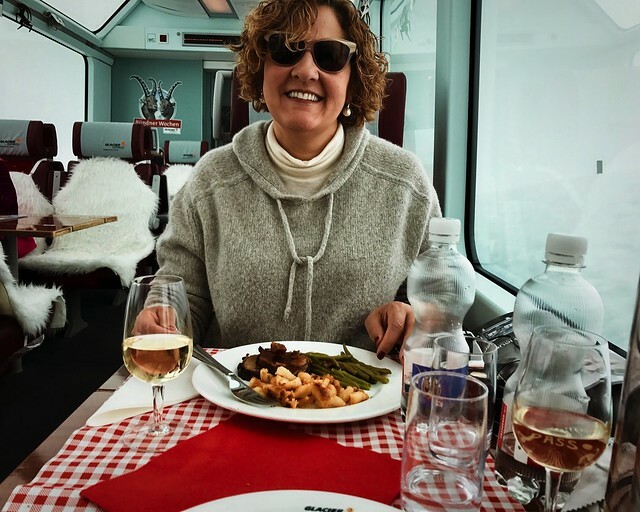 The Trenino Rosso climbs the Bernina Pass (at more than 7,000 feet), passing through 55 tunnels, over 196 bridges, and through an Alpine landscape of snow-capped peaks and pristine glacial lakes. In addition to the scenery, the line is dotted with impressive feats of engineering, including the soaring Landwasser Viaduct, the spiral-shaped tunnels between Bergün and Preda, and the famous Brusio Circular Viaduct; there a a couple of points along the route where the curves are so sharp that you can see the train in front of you. There can be anywhere from a dozen to over 20 stops along the route, including St. Moritz—where you can break up the trip with a stop—and Ospizio Bernina (the official border between Romansh-speaking Engadine and Italian-speaking Valposchiavo), depending upon the time of day and seasons; the stretch from Thusis to Tirano has been recognized as a UNESCO World Heritage site. 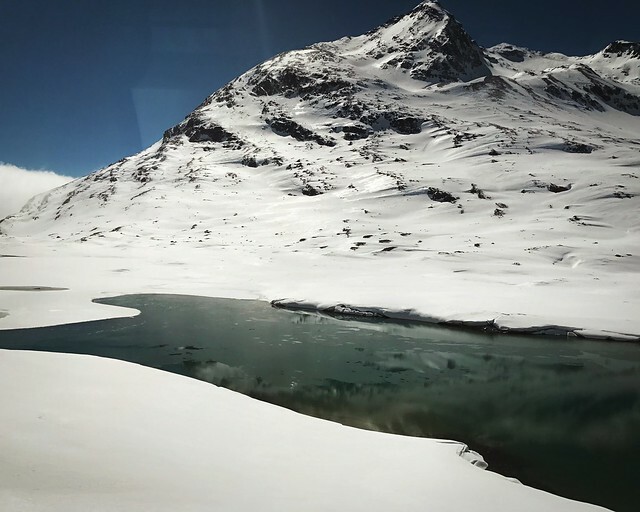 All cars on the Bernina Express are fitted with picture windows, but from late June through September there are also open-air panoramic cars for optimal photography. 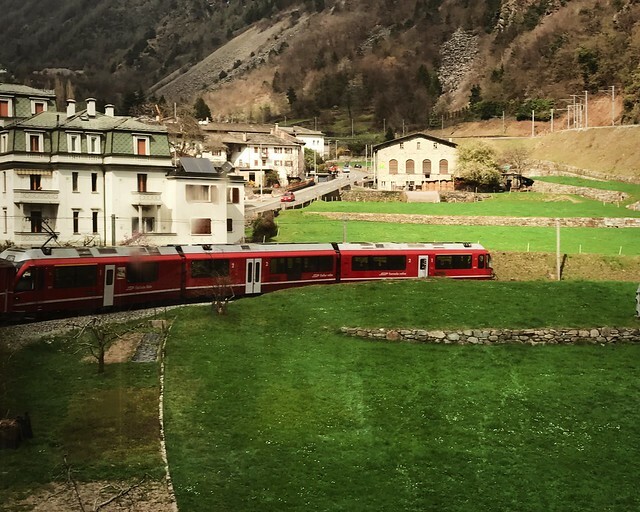 Trains run all year round, with additional routes between Davos Platz and Tirano and St. Moritz and Tirano–the two most popular stretches–in the summer months. You can easily connect to the Italian rail system in Tirano (the station is connected to the arrival point) and head west towards Varenna and eventually Milan. There is no restaurant car, but a refreshment cart is available and passengers can pre-order a cheese and charcuterie platter for their trip. There are first and second-class seats, both of which can use the on-board app for information and explanations during the ride.